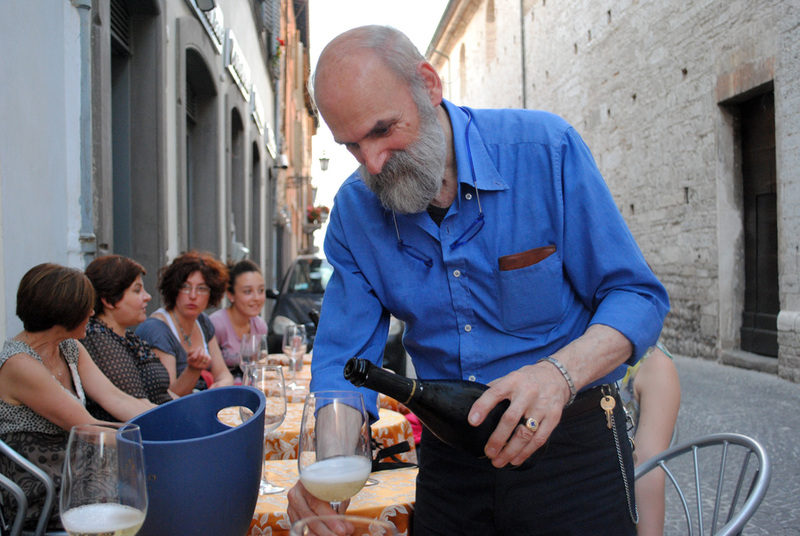 Luigi Gazetta begins to fill the glasses as his guest come gether around the tables. Photo by Janel Koval for Gonzaga in Cagli, Italy. 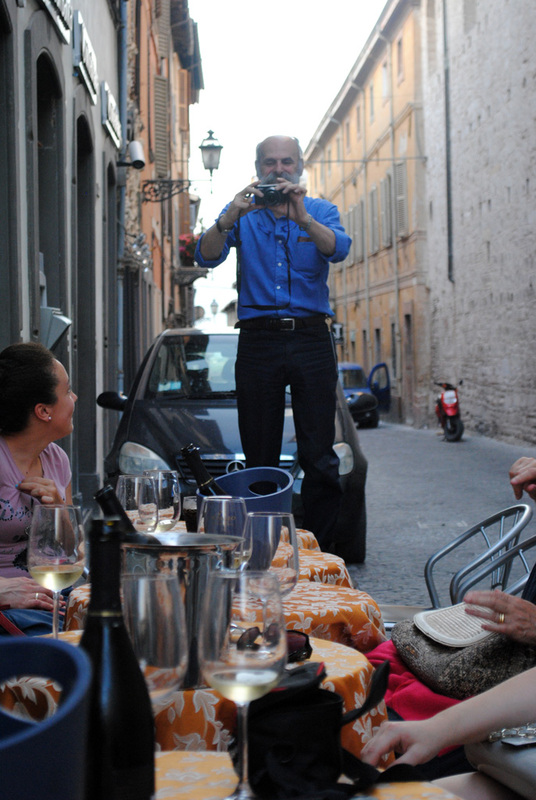 luigi Gazetta entices a friend to join in his weekly Friday festivities outside of Caffe Del Corso. Photo taken by Janel Koval for Gonzaga in Cagli, Italy. Every Friday night, all of the store keeps gather to gossip about the happenings in Cagli. Photo taken by Janel Koval for Gonzaga in Cagli, Italy. Always the photographer, Luigi is sure to capture memories at every Friday party. Photo by Janel Koval for Gonzaga in Cagli, Italy. Luigi Gazetta stands outside his phote studio talking to other local store keeps and friends. Photo taken by Janel Koval for Gonzaga in Calgi, Italy. 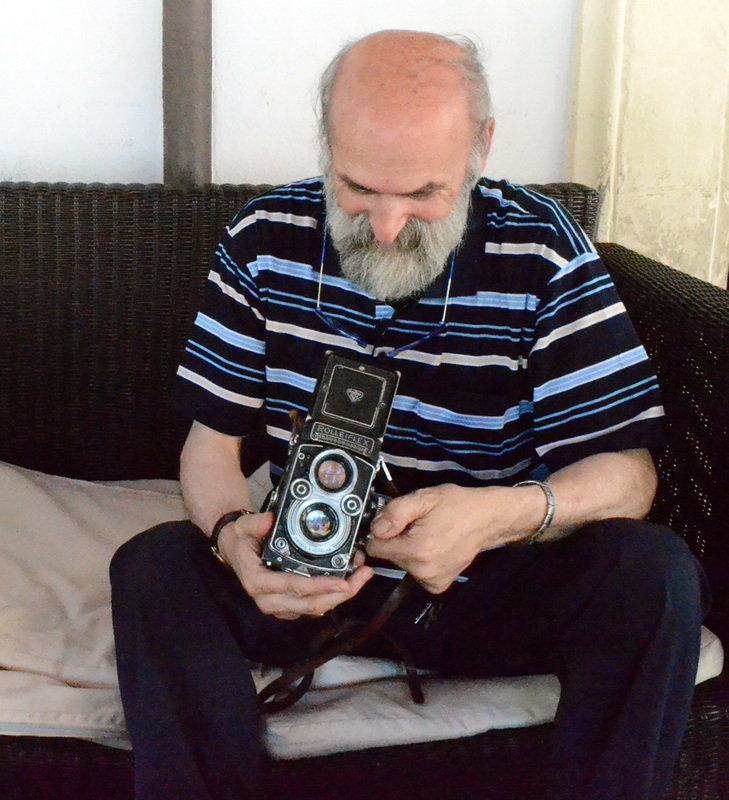 Luigi holds his precious camera in his hands so to never miss an opportunity to preserve a memory. Photo by Janel Koval for Gonzaga in Cagli, Italy. Step into Mario Carnali’s office, and the history of Cagli, Italy, comes alive. 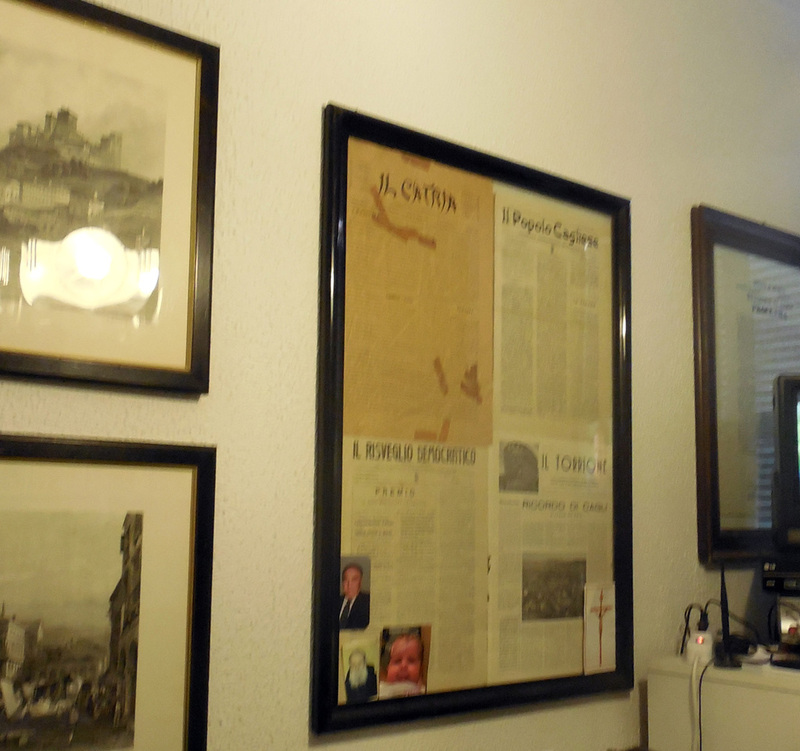 Framed newspaper articles hang on the wall. Historic videos from years past line the shelves, and newspapers both current and historic are strewn across the table. 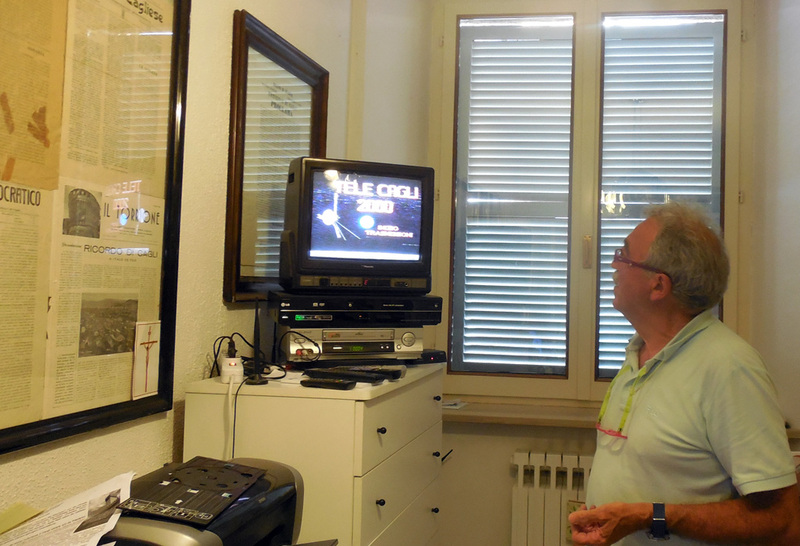 As a journalist, Mario has been capturing life in Cagli and the Marche region for over 40 years. During those years, he has reported on hundreds of topics and nearly every facet of Italian life. To this day, his passion for writing remains. An influential businessman and journalist, Mario stands out in his hot-pink-and-green- framed glasses. His eyes look wise, filled with knowledge about his community and the histories he has told. Mario was born in Cagli, and “I am not going anywhere,” he says proudly. From the ages of 14 through 18, he was trained in a technical school for farmers. 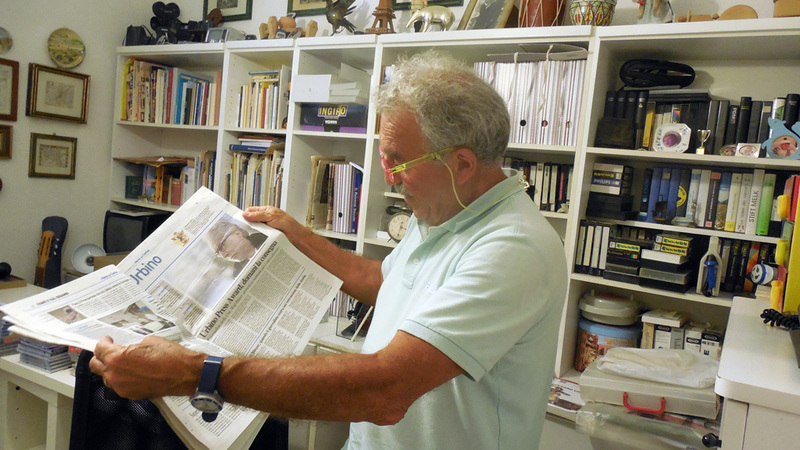 Mario realized his passion for writing when reporting for the Farmer’s Review in the Marche region. From 1976 to 1984, Mario worked as a journalist for the Corriere Adriatico. 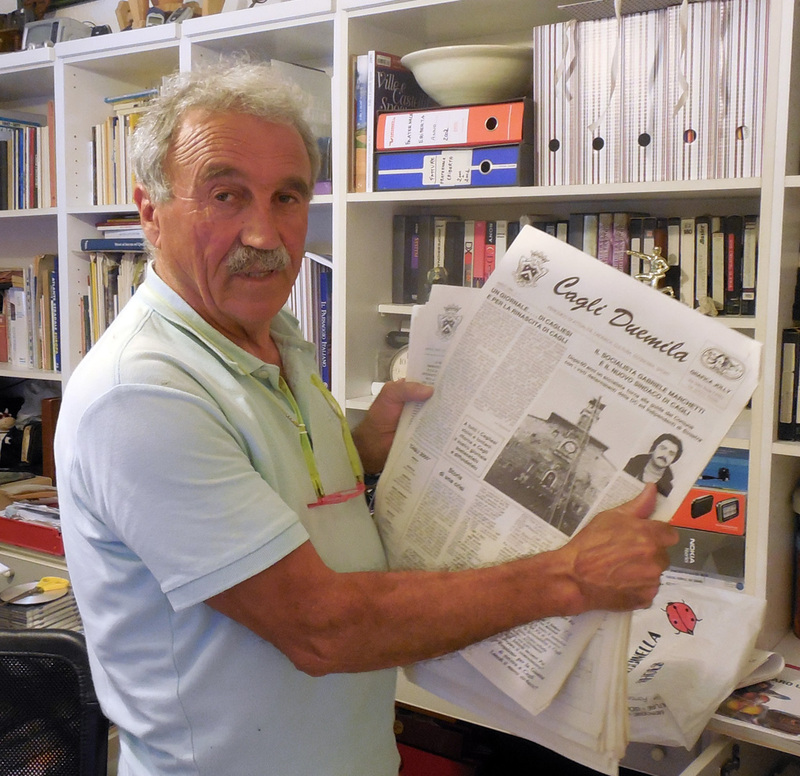 After writing for the newspaper for eight years, Mario quit because he was “fed up.” He created the Duemila paper in 1984, and later expanded the newspaper to include a television show. He was involved in all aspects of the show including production, filming, and commentary. In his office, tucked in a corner, is the large camera that he used to capture video for the show. The television show expanded on the articles he had written for Duemila. In 1992, after many successful years, Duemila was consumed by a larger news outlet. 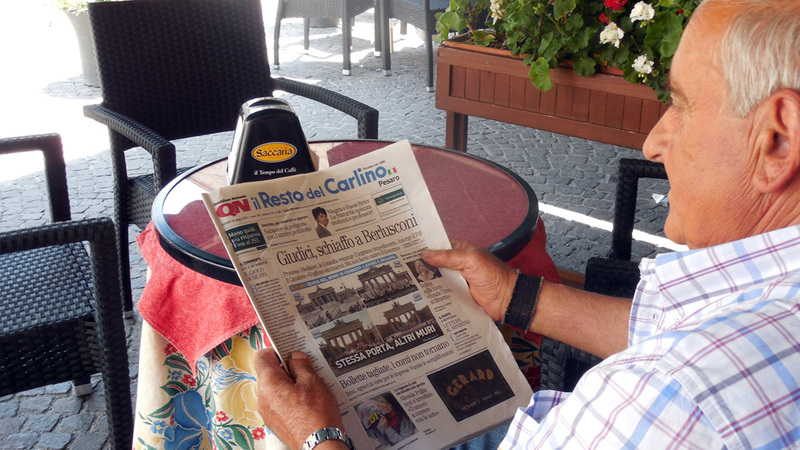 Since then, Mario has worked with the regional paper il Resto del Carlino, a newspaper based in Bologna. Founded in 1885, il Resto is one of the oldest newspapers in Italy and has a circulation of 165,000 people. When asked about his favorite article, Mario’s eyes sparkle as he talks about the stories of the past. He has written so many he can’t remember a favorite, although he does mention his love for history and the stories he wrote about the Jewish people in Italy during the Fascist Era. On most nights, the pillars of the community assemble on the wall of City Hall in Cagli’s piazza. 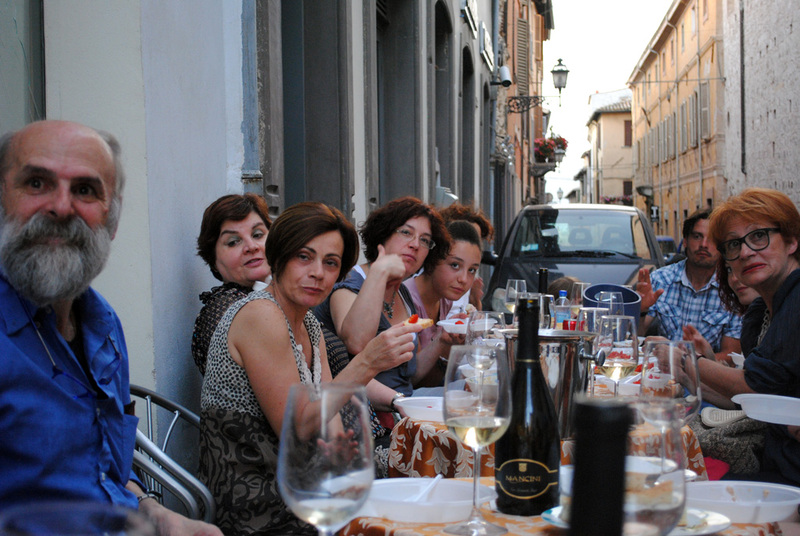 The tables at the caffés fill up with Cagliesi who chatter about current events as they enjoy wine and gelato. This is Mario’s second office, and it comes alive at dusk. The culture of the small historical community radiates in the piazza, he says. “This is one of my main sources for stories.” In the piazza surrounded by Cagliesi, Mario leans back comfortably as he gathers information for future stories. The 15,000 people of Cagli know they need to find Mario if they have a story to tell. Many of them do so during the course of a night in the piazza. Cagli is steeped in history. The Rocca Torrione, built in 1481, towers over the city. Cobblestones line the streets, and the stone buildings are rooted in the earth. However, Cagli is in touch with the 21st century. When Mario meets someone new, he connects through social media, especially when there is a language barrier. “Technology has created extraordinary changes in the media,” he says, adding that he embraces the ease of technology. 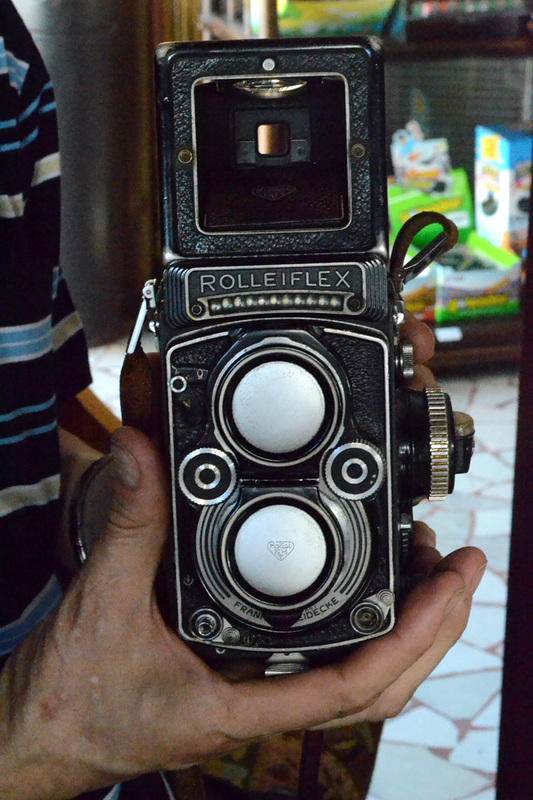 The large camera used when he produced the television show dwarfs the flip video technology he uses today. 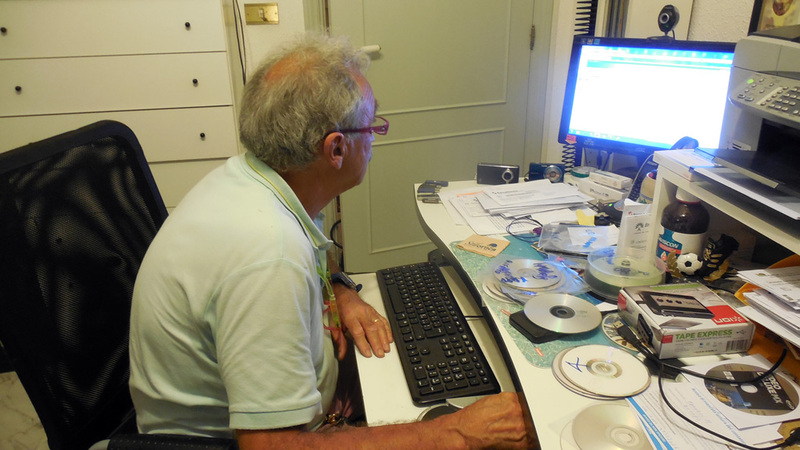 Instant uploads and shorter stories capture Cagliese life. Mario has lived an extraordinary life and built an influential career as a journalist. His commitment to the community continues as he transitions into semi-retirement and freelance writing. He is active in the community, working on grassroots efforts to maintain the quality of life for Cagliesi for generations to come.